Some things like TV shows or game series, they just reach that point when they just keep going. And it seems so natural that they are there, but at the same time you wouldn't notice if they stopped one day. These are my feelings about Farm Frenzy 4. But what do I know?.. There have been quite a few changes made, and it seems that like always not all of them will be loved, not all of them will be hated. Even though the introduction does describe my feeling, it is not quite fair to Farm Frenzy 4 because of all the changes the game actually features in this release. 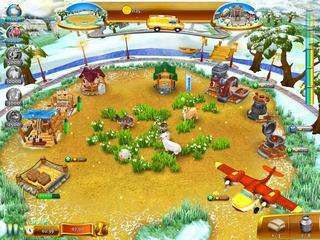 The story is similar to many stories of many games of time-management farming games. You need to help grandpa and grandma with the farm and save it from forclosure. 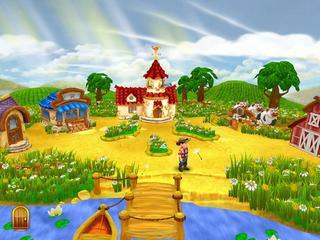 The game is bright and full of colors and different sounds that you would expect to hear at a farm. The only problem is that it is sometimes difficult to see the differenciate some items from another, which is a problem in a game of this genre where you don't want to stare at items for a long time. Here's a few changes that seem helpful. You can cage several bears and it still doesn't take up too much space. There's a bird that gives you extra money if you are able to click on it while it is on the screen. The tutorials can be skipped if you want to. There isn't much upgrading going on in this one (I'm sure that will provoke different reactions, too). The game is full of new features that will either make you love or hate it. The only way to know is to try the free version! This is Farm Frenzy 4 review. Download this game here.